The chrome fitting around the inside door handle is held on by a single screw. Remove the screw, and "snake" the fitting off the handle. The window crank is held on by a small pin (the photo shows the pin being put back in upon reassembly). There are two pin holes that hold the pin. They are at 90° to the shaft of the handle. One of them will have the pin. 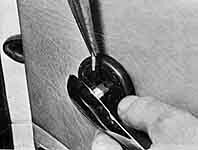 Use two flat-head screw drivers on each side of the handle to pry between the handle and the black plastic allowing you see in there enough to see which pin holes were used. Use an awl or other sharply pointed tool to push the pin out. The crank will come right off but be careful not to loose the pin, it is very small and rolls easily into dark places. If you do loose it, a welding rod (3/32" - 1/8") or coat hanger wire makes a great substitute. Score it with a hacksaw about a 1/2" from one end. After pushing the rod into the crank hole, break it off at the score mark. The easiest way I have found to remove the door panel is using a pair of needle nose pliers. If you are going to remove the panel for replacement it is easy, just rip it off. But if you plan on using the panel again it can be tricky to remove with out breaking the pressboard. Years of moisture weaken the panel. Clips will pull through the soft pressboard. The key is to pull on the clip only without putting, or trying not to put pressure on the panel itself. Use a flat screwdriver to hunt around between the panel and the door frame. When you locate a clip try to grab it from both sides with the needle nose pliers. Pull outwards (toward the edge of door) while prying out will get the clip out. The first few are the hardest because of the blind hunting required; you may get frustrated and just start yanking. Go slow and gently. For locations of the clips, visit the clip location page. It will help you to know where to start looking. replace the gasket around the outer door handle.